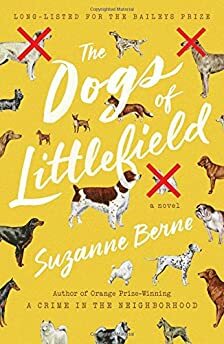 Largehearted Boy: Book Notes - Suzanne Berne "The Dogs of Littlefield"
Book Notes - Suzanne Berne "The Dogs of Littlefield"
Suzanne Berne's novel The Dogs of Littlefield is a surprisingly dark and compelling comedy of manners. "A compelling, poignant yet unsentimental novel that examines life, love and loss. Original and brilliant." The Dogs of Littlefield is a social comedy about menace, and I think a playlist for it would have yearning and anxiety as unifying themes, which happen to be standard musical fare, but I did manage to narrow my choices down to a few songs. In my novel, Littlefield is lovely comfortable suburban New England town, far from the conflicts and traumas of the "Global Village." So comfortable, in fact, that it's been listed by the Wall Street Journal as one of the Twenty Best Places to Live in America. It's also home to one percent of the nation's psychologists—and has thus come to the attention of a social anthropologist, Dr. Clarice Watkins, who arrives to study the effects of global destabilization on a place that should be exceptionally stable. But coinciding with her arrival, someone begins to poison dogs at the town's first designated "off-leash" dog park, subject of much local contention. Is the poisoner a crank, a crackpot? A domestic terrorist? I meant for Littlefield to be exactly that: a "little field" on which huge gravitational forces are at play. Forces that go almost unnoticed because people are so caught up in worrying about dog parks and rocky marriages and their children, and also in yearning for something more in their lives—without knowing how to articulate that yearning--that it's hard for them to notice much else. Whatever is closest to us is will always demand most of our attention. And searching for comfort is a basic human endeavor, no matter how "comfortable" other people believe you to be. Yet, at the same time these are American suburbanites, the most secure, fortunate people in the world: People who should have enough bandwidth to worry about the rest of the planet, besieged by war, pestilence, persecution, famine. But if those people are haunted and unhappy in the suburbs--those Edenic swaths of lawn and shade trees and coffee shops--what hope is there for anyone else? Two of the novel's main characters, Bill and Margaret Downing, are going through a terrible time in their marriage. Bill is a hedge fund manager, whose company is about to be investigated by the SEC, and Margaret is a "stay-at-home mom," who is close to becoming agoraphobic. He no longer feels desire for her; she feels despair about him. They still care for each other, but it's through a fog of anguish. And yet once they were young and full of energy and optimism. How could that all have changed? One of the early chapters is told from Bill's perspective, and these lyrics express his lonely bafflement: I work in the city we live together/But it's different than my dream/Morning light fills the room I rise and she pretends she's sleeping/Are we everything we wanted? Maybe the most panic-stricken pop song ever written. Several times during the novel, poor insecure self-effacing Margaret begins to think she's going mad from the stress of her dissolving marriage and her concern about her troubled middle-school-age daughter. Even walking her dog down the street turns into an encounter with phantoms—she thinks she sees the ghosts of the town's poisoned dogs everywhere. This is the sort of song that I imagine would shriek in her mind, especially the lyric "I'm going to fade away." Margaret develops a drinking problem, because of the difficulties mentioned above. The horses of this song are certainly coming for her. In her attempt to run from her problems, she runs into the arms of another man, a not-very-good writer named George, who is working on a novel about a zombie baseball player and pining for his ex-wife—which, of course, doesn't improve matters. The dog days are over for them both, alas. Someone once told me this song was inspired by The Ice Storm, a movie based on Rick Moody's novel about two unhappy suburban families in the Seventies. The song certainly captures the fragility of a marriage about to fall apart, and the desperate attempts of each partner to keep things together, at least in front of the neighbors. Margaret is certainly living in a house of cards, and George's house has already collapsed. Some of their attraction to each other is based on that recognition, and genuine sympathy for another human being in pain. When Dr. Clarice Watkins arrives in Littlefield to begin her fieldwork, I'm pretty sure that she sees the town the way the Monkees depicted the suburbs in this song— "Rows of houses that are all the same" in "status-symbol land." I have never been very good at hearing lyrics and as a child I thought this was a good-natured song with a bouncy, upbeat melody, a celebration of the suburbs instead of a savage takedown, which was doubtless the Monkees' intention. An irony Clarice would have appreciated. Though they have so much, at least materially, most of the inhabitants of Littlefield are haunted by the idea that they're missing something vital, and that they are confined and hobbled, but they don't know by what or why. "Who can say where we're going?" this song asks plaintively, a question that encapsulates their uncertainty--wherever it is, they aren't in control of the steering wheel. Meanwhile all this confusion is set against the actual loveliness of where they live, beautiful in winter, spring, summer and fall. The world itself is the "more" that's available to them – but they are in danger of never realizing it. One of the characters, Emily Orlov, has this as the ringtone on her phone. She is a Russian Studies professor, whose husband, an economist, is having an affair with one of his graduate students. Emily knows/doesn't know what is happening, despite obvious signs one evening when she prepares an intricate Provencal stew that goes unappreciated by her husband and his haughty, skinny graduate student, their dinner guest. In any case, her interest in the sound of "unrest," which she feels is expressed in this concerto (written before the Russian Revolution), is evident to everyone but her. She's also the owner of one of the poisoned dogs. The favorite song of another character, Hedy Fischman, an elderly retired psychoanalyst who lives next door to Margaret and Bill and once specialized in trauma therapy. "That miserable woman," is how she refers to Piaf, with great appreciation. In her view, Edith Piaf is proof that, at least sometimes, you can feel good about bad things. My daughters were listening to this song quite a bit at one point, and the refrain "We're fated to pretend/To pretend" followed me around through the house for weeks. Pretending is the silliest and bravest thing human beings do, in my opinion. And I suppose that's how I feel about the inhabitants of Littlefield, who are absurd and, in their own ways, courageous in about equal measure. I hesitate to mention this last song, because it is utterly desolate—it ends with a howl--and I am trying to persuade readers that I've written a comedy. But the truth is, I wrote this novel partly because of this song, which I love, though it makes me shiver. It is so bleak and so lonely that it's all but unbearable. I wanted to write a comic novel because the world is full of frightening things and we do have to bear them. No matter where we live, black-eyed dogs will call at our doors, snarling and showing their teeth, and sometimes our only defense is to laugh at them.